Endurance runners today braved a chilly evening to perform one of the most spirited workouts of this training season. The workout was at Piedmont High School, in Piedmont, California. Kenyan-born U.S.A. coach, Dr. Cory Nyamora is training the runners. He is the Director of Endurance -- A Sports and Psychology Center. He is a U.S.A. certified Track and Field as well as Triathlon Coach. Endurance Sports and Psychology Center begun training 2012 half marathon runners yesterday at Piedmont High School, in Piedmont, California. The center's director, Dr. Cory Nyamora, is personally coaching the runners. He was born and raised in Kenya, the land of long distance runners, and educated and trained in the United States. He is a USA certified coach for both Track & Field as well as Triathlon. The training, under floodlights but chilly conditions, consisted of tips on how to run efficiently and safely. Dr. Nyamora demonstrated the right running and stretching techniques. He stressed the importance of learning and sticking to the right running techniques and stretching because that prevented injury. What: A fun engaging half-marathon training program for adults who want to have fun, get fit and be around a healthy community. After 12 weeks of training you will participate in the Oakland Half-Marathon! Join Cory Nyamora and the Endurance team and train in a supportive, positive and structured training program. Beginners and those who are a little nervous and intimidated by the idea of running a half-marathon are strongly encouraged to join us! Sign up now to join this adventure and learn to fit exercise in your life in a fun, healthy way. Where: Varying locations in the bay area. Sign up Now: Please sign up now to save a spot. The program is almost sold out! E-mail admin@endurancecenter.org or call 510-981-1471 for more information. Coach: Dr. Cory Nyamora is a certified USA Triathlon coach, USA Track and Field Coach and licensed Clinical Psychologist. He is the owner and director of Endurance – A Sports and Psychology Center, Inc., a company that provides sports opportunities, outdoor adventures and psychotherapy for children, adults and families. He is committed to helping individuals and families find fun ways to stay fit and active. Dr. Nyamora's runners were among those who took part in the San Jose Hard Rock Marathon in October and are featured in a video you can access by clicking here. The program is almost sold out! E-mail admin@endurancecenter.org or call 510-981-1471 for more information. What: A fun engaging half-marathon training program for adults who want to have fun, get fit and be around a healthy community. After 12 weeks of training you will participate in a California half-marathon! Join Dr. Cory Nyamora for an information session on the half-marathon training program. He will discuss the training philosophy, program, gear, and how to sign up to join this adventure. RSVP: Please RSVP and let us know if you can make it to the session. If you are unable to attend the information session but are interested in the program e-mail admin@endurancecenter.org or call 510-981-1471 for other options though it is highly recommended that you make one of the sessions. The Kenyan born US coach has trained runners who successfully participated in San Jose Marathon last month. Dr. Nyamora, a clinical psychologist answered this question today after a training session for marathon runners at Redwood Park, in California. Born in Kenya, Dr. Nyamora was educated and trained in the United States. He is a U.S.A. Track & Field Coach and U.S.A Triathlon Coach. He is the Director of Endurance-A Sports and Psychology Center. He is coaching marathon runners all over the United States. On September 3, 2011, Endurance half marathon training took place at Redwood Park, in California. Kenyan-born and USA certified coach, Dr. Cory Nyamora, conducted the training. View the picture gallery to get a glimpse of the beautiful scenery the runners enjoyed. Clark Kerr Track, in Berkeley, provided ideal workout ground August 11 for Endurance half marathon runners, who have been training since July 10. The training was organized by Kenyan born US coach, Dr. Cory Nyamora, the director of Endurance--A Sports and Psychology Center, based in California's San Francisco Bay Area. Dr. Nyamora is training half-marathon runners countrywide. Clark Kerr Track is bare and provided a natural place for a marathon runner to practice running on unpaved dusty ground. The weather was also ideal for the strenuous workout techniques Dr. Nyamora shared with his enthusiastic and motivated runners. Dr. Nyamora as he demonstrated various workout techniques to the runnersDr. Nyamora was born in Kenya, a country known for its long distance runners, and educated and trained in the United States. He is a licensed clinical psychologist and a certified USA Triathlon coach, USA Track and Field coach and Youth Fitness Specialist. His center provides sports opportunities, outdoor adventures and psychotherapy for children and families, as well as adults. Dr. Nyamora also provides services at a leading weight-management program at the Children's Hospital Oakland. He works closely with individuals to find fun and effective strategies to stay healthy. Endurance center half-marathon training gathered pace yesterday (August 6, 2011) as the runners completed their fourth week workout at the beautiful Crowne Memorial Park, in Alameda, California. Dr. Kenneth Kim supervised the training in the absence of the regular coach, Dr. Cory Nyamora, who took a few days’ vacation. Before beginning yesterday’s strength and endurance building workout, Dr. Kim advised the runners to refrain from focusing on the negative when faced with difficulties or obstacles of any kind. Dr. Kim, a good bicyclist, gave an example of how negative thought could lead to a disaster. He said that if a bicyclist, going downhill, focused on the fear of hitting a stump on the way, there would be no time to think of how to avoid the danger. Instead of focusing on the negative, he said, the bicyclist should be thinking of how to avoid the obstacle. On Dr. Kim’s request, the runners shared their experiences on how negative thoughts might have affected their performance and how positive mindset had helped them. Dr. Kim congratulated the runners for a successful workout. He awarded the week’s Endurance medal to Regina for overcoming earlier difficulties and completing the workout with a smile. 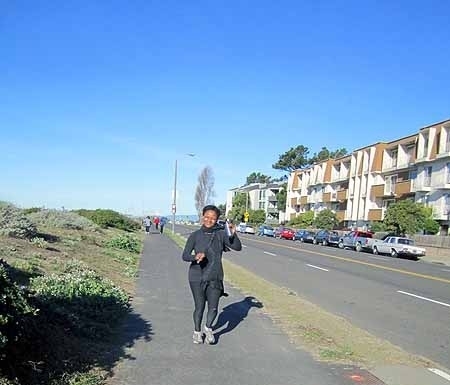 The half-marathon training, taking place countrywide, was organized by Endurance—A Sports and Psychology Center, based in San Francisco Bay Area, California. The center’s director is Dr. Nyamora, who was born in Kenya and educated and trained in the United States. He is a licensed clinical psychologist and a certified USA Triathlon coach, USA Track and Field coach and Youth Fitness Specialist. In our last story, we erroneously reported that the July 26 workout was the second of the Half-Marathon training sessions. In fact it was the third training session. The workout just completed was the fourth. The second training session was held on a Tuesday afternoon, July 26, at Piedmont High School, Piedmont. The weather was beautiful. The training focused on strength and endurance building as well as the right running techniques. Dr. Nyamora gave demonstrations on how to run and avoid injuries. Besides coaching marathon runners, Dr. Nyamora’s center provides sports opportunities, outdoor adventures and psychotherapy for children, adults and families. Dr. Nyamora also provides services at a leading weight-management program at the Children's Hospital Oakland.